It was in 2008 that work started on the construction of the Edinburgh tramway. We start our programme in 2009 where we see the mock up of two sections of the proposed tramcar design at Western Harbour. It was displayed in what was then the current Lothian Buses ‘Harlequin’ livery. The fleet now consists of 27 CAF trams built to an Edinburgh design at their factory in Spain. They are in a version of the bus livery featuring madder red and silver on a mostly white base with a new Edinburgh Trams logo. Our cameras also filmed some of the construction in Princes Street during the same year. We now move forward some five years to spring 2014 and witness some of the test workings, which started during 2013 between the depot at Gogar and Edinburgh Airport and by the 4th December 2013 were reaching the city centre along Princes Street. Our filming takes place over two days showing trams running along Princes Street, through St Andrew Square to the York Place terminus. We also record the running from Princes Street to Haymarket where the street running finishes as the trams head off towards Murrayfield running parallel with the mainline railway. The official opening of the tramway took place on Saturday 31st May, but our cameras arrived on the 2nd June, the third day of operation. We film the action at Ingliston Park & Ride stop, where the trams arrive from the airport before heading off into the city and visa versa. The following day our cameras spend the entire day on the system. We begin at Ingliston Park & Ride where we board tram 267 for a cab ride of the whole route to the terminus at York Place. From our vantage place behind the driver we can see the route and its infrastructure and how the tram copes with the traffic on the street section from Haymarket to York Place. On arrival at York Place we film the trams arriving and departing and then continue to film the action at St Andrew Square, Princes Street, Shandwick Place, West End – Princes Street and Haymarket. Having recorded the driver’s view of the system we now take up the passenger’s view as we board tram 251 at St Andrew Square to Haymarket. 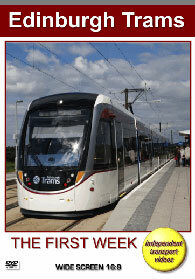 From Haymarket we travel by tram to every station to Ingliston Park & Ride. At each stop we film the arrivals and departures before continuing our journey by tram. In all a total of ten trams are travelled on. There are helpful subtitles to guide you on your journey as we give this comprehensive view of Scotland’s brand new tramway. Enjoy the ride.